FIRE & The Retirement Manifesto: What Will You Do With Your Free Time? 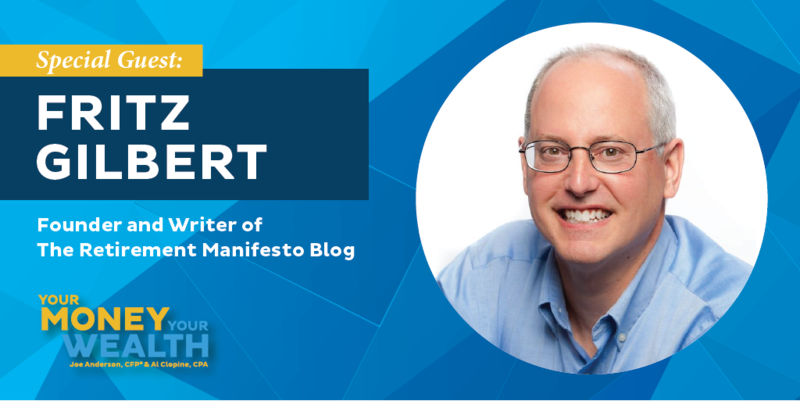 Fritz Gilbert, blogger at TheRetirementManifesto.com, one of the fastest growing financial blogs on the internet, talks about the Financial Independence / Retire Early or FIRE movement, and how to make the most of your retirement. Also, three tax tricks just for retirees and more on the Trump Administration’s proposed tax reform. Plus, Joe and Big Al answer calls and emails on donor-advised funds, day-trading, and risk tolerance vs risk capacity. (21:18) Fritz Gilbert: What Will You Do With Your Free Time? (54:20) Can I Day Trade My Roth IRA Account? That’s Fritz Gilbert, blogger at TheRetirementManifesto.com, one of the fastest growing financial blogs on the internet. Today on Your Money, Your Wealth, he talks about the Financial Independence, Retire Early or FIRE movement, and how to make the most of your retirement. Also, three tax tricks just for retirees and more on the Trump Administration’s proposed tax reform. Let’s hope you can still use those three tax tricks! Plus, Joel – I mean Joe – and Big Al answer your calls and emails on donor-advised funds and day-trading, and Joel – I mean Joe – goes off on the difference between risk tolerance and risk capacity in response to an email asking about moving a 401(k), all because Juan didn’t say “Hi Joe.” I mean, Joel. No, wait! Anyway, here are Joe, yes JOE Anderson CFP and Big Al Clopine, CPA. JA: Al and I, we were on Jordan Goodman’s show. AC: Yeah that was fun. He had us on for an entire hour. I felt honored. JA: Those questions he was asking?You felt… “So how is that going to affect the economy? What do you think about the markets?” Have you listened to one show? You were on our show, Jordan! We’re not economists! AC: It was mostly about the tax reform united framework. JA: That’s probably not going to happen. AC: But, I guess it’s a natural thing to say, “do you think it’s going to pass?” And then the next question is what sort of impact on the economy? And I noticed, a lot of times, we said, “Well, we’re not economists, so this is our opinion. This is my opinion.” And then that’s about as good as we could do. JA: Haha! With this whole estate tax issue, it’s interesting. When you hear about the estate tax, it’s like OK, well, that’s only for the ultra rich, and so on and so forth. Sure, yeah it is. But hypothetically, Al and I saw a young couple this week, in their 20s. AC: We have a lot of hypothetical meetings, don’t we? JA: We do. We’re not busy, we just make it up. AC: Virtual reality, augmented reality. We think we’re in a meeting? JA: Yes. So we met with this young couple in their 20s, and this guy’s mother died. And she had a fairly large estate, but it was kind of a unique scenario, where, in this instance, the first time, it was like if it was a little bit more lenient in the sense of how to kind of pay it, because I’m from Minnesota. I’ve heard farmers lose the farm, and this and that, because of the estate tax. They die and the farm is worth X, because there’s so much acreage there, but they’re farming it, and they’re not making a ton of money. The kids don’t want to sell the farm. But then they have to sell the farm. AC: They have to, there’s no choice. How do you pay the tax? JA: So similar scenario, the estate was basically two homes. AC: Yeah, but a couple of valuable homes. JA: Well one very valuable home. it’s like, well, do I want to sell this? AC: Or if I sell it, maybe I’ll have to fire sale it because I’ve got certain restrictions on when I need to pay this tax. JA: Yeah, it’s like an $8 million home, you’ve got probably $15,000 a month just maintenance for the pool guy, the gardener, cleaners, everything else. It’s like how do I do this? And then there’s blood in the street if they hear, “oh well so and so died, and they need to sell this house.” So it’s just kind of sad in that scenario. AC: Well it is, and of course this can apply if you’ve got a big family business, not unlike a farm. You’ve got a big business, and it’s got a decent cash flow. You’re covering your salary and maybe your kids are employed or maybe not. But maybe the kids are employed, they’re going to take over the company. But now the companies were 20 million bucks and your state tax is about $8 million on that. And it’s like, well how do you get that money? JA: I still want to run the business. It’s my job. AC: Yeah, So I gotta borrow? I can’t even borrow $8 million. So I guess I’m going to have to sell the business. And that is the side of why estate taxes aren’t really fair. And there’s an even stranger situation, Joe, and that is if someone sold a property, or sold a business, and they have a note receivable from the buyer. Well, that’s value. You have to pay tax on that note, even though you have no cash. How do you get cash to pay for that? JA: Yeah, let’s say I’m going to pay you $10 million over the next 10 years. AC: Right. And so that’s a $10 million note in your estate, and you’ve got to pay $4 million tax on that. JA: And you haven’t received a dime from that note yet. AC: Right. How do you do that? So there are definitely some challenges. I guess until you can think about these things, you think, “Well, these wealthy families, it’s a drop in the bucket for them, no big deal, and they just pay the tax and move on, and maybe this is the right way to redistribute the wealth. And even Warren Buffett says we should have estate taxes because otherwise, we’re going to encourage family dynasties. I don’t know whether you agree or disagree with that. I’m just saying that’s what he said. So I don’t know. JA: Like the Vanderbilts and the Rockefellers and the Fords. JA: Yeah. But I guess it’s always planning though. You can always zero out the estate tax. AC: You can. There are different kinds of trusts and advanced estate planning techniques where you can do that. You are right. The problem though is almost every technique that you can come up with, there are side effects. You give up some control, or you give up cash flow, or you give up some of the benefits of this particular asset. And in many cases, the patriarch or matriarch doesn’t want to do that. And I understand that too. AC: And they say that as fast as they can so you can’t even understand it. JA: Right it’s like what the hell did they say? And then all of a sudden the beautiful music and a butterfly comes flying across the screen. AC: Or it runs across the screen in such small print that there’s no way you could actually read it. You’d have to have a 200 foot TV to read that print. JA: Right. This will have suicide thoughts, don’t have an ounce of alcohol. AC: (laughs) Right, If you feel suicidal, stop taking the drug. JA: (laughs) Before. Anything else on tax reform? Probably not going to happen. AC: For those of you that haven’t heard about it, basically it’s reducing our tax rates from seven different brackets to three different brackets, the highest one being 35%, down from 39.6. The corporate rate comes down. They continue mortgage interest and charitable deductions, but they eliminate medical deductions. JA: Yeah but this is all going back to the drawing board, it seems like. I’m curious what the next thing is going to look like. AC: Well it’s true. I will just editorialize here for one second. So this tax reform United Framework that was announced about three weeks ago by our president. It’s nine pages. Nine. JA: Well the next one will be 12. AC: And the first three pages are just fluff. What our goals were. Well, the first page is a nice logo. The first page is a logo, and the second page is a quote, and the third page is, “here’s our goals” and pages 4 through 9 is the tax reform thing, but I will tell you, there’s a lot of big print, and a lot of blank pages. JA: Well isn’t that what we want, Al? Simplicity. JA: (laughs) Keep it short and simple! Like how tall is the tax code? If you set the tax code up, in those volumes, it’s like 6 feet tall, right? AC: Yeah. More than that. Last I heard was Roger Hedgecock, and of course, he knows all. It’s about 14 feet. JA: OK 14 feet. To nine pages! Actually, four! AC: Yeah, but life is more complicated than this. There are so many things that aren’t in here, that will have to be figured out before anything can ever be voted on. That’s the problem. JA: Have you ever seen this movie, and I know the answer, and I don’t know why I’m asking this, but I am anyway. The Book of Eli with Denzel Washington? JA: So that’s the movie I was watching. So he’s got the Holy Bible, it’s he’s in some crazy, like, I don’t know what happened to the world, but it was very bad. It’s way in the future and everyone’s killing each other and everything else because the Bible is gone. But he’s got the only one. So everyone’s trying to get at him to get to the Bible. And then he’s like killing all these people, and he’s like martial arts expert, and shooting people, and then guess what. Spoiler alert. He’s blind. So they finally stole the Bible, but the Bible was in Braille. So he went to this little-promised land, where he wanted to deliver the Bible, but he recited the Bible word for word. So why I’m saying this is that this guy is writing the Bible, and it was like ten thousand pages. Anyway. JA: Hey, that is called filler. That is called filler. How is this massive tax reform, from 14 feet worth of tax code down to 9 pages, going to affect you? (No filler there!) Regardless of whether it passes before the end of 2017 or not, it’s time to start end of year tax planning now to help you not just this year, but for the rest of your life. Call Pure Financial Advisors at 888-994-6257 and make an appointment for a personalized tax reduction analysis. That’s 888-994-6257. Don’t wait until the last minute – find out how your current tax strategy may be changing before the end of 2017 – which is just weeks away – and what you can do to reduce your tax burden. Get a forward-looking, personalized tax reduction analysis at no cost or obligation to you. Call Pure Financial at 888-994-6257. 888-994-6257. JA: Big Al, it’s that time. AC: Yeah, I can’t wait. JA: We’ve been doing this podcast and radio show for it feels like 20 years. AC: (laughs) Yeah it does. It’s what it’s been about what 40 years? JA: It feels like it! But we’ve got this gentleman on the phone, or on the line. He’s got a blog. It’s the 10 fastest growing personal finance blog in the world. How the hell did he decide to come on our show? JA: It is the Retirement Manifesto. Anything with the word manifesto in, it’s like we gotta get him on. AC: It’s gotta be good. JA: Let’s talk to Fritz. He’s been a holding on. Fritz, welcome to the show, my friend. FG: Hey guys it is truly an honor. I appreciate the chance to talk with you. JA: Tell our audience a little bit about your background. It’s very unique. You’re going to retire early at 55, and you’re a commodities trader and then now you’re writing blogs, the fastest growing blog. What the heck is going on? FG: I tell ya, life’s been good. I’m always willing to try new things, explore things. The blog was just something I played around with a couple of years ago, and I just wanted to kind of take a flyer at it and see if that might be something that I could start up and continue after I retire. So, a quick story of my life. I went to college, normal routine, a business major, got a job in corporate America, and I’m the last of the dinosaurs. I’ve done 32 years so far in one company. Multiple jobs, moved around the country, 9 different places, and I’m fortunate enough to have a pension. So between the pension and pretty aggressive savings, we’re going to be getting out next summer at the age of 55, my wife and I, and our daughter just got married this summer and she moved up to Seattle, so we’re truly empty nest and getting ready to fly. We’re excited about it. JA: So right now, we’re doing this podcast. Al and I are in this hotbox studio, and where are you again? Are you in the Appalachian Mountains? AC: In some nice cabin? FG: I kinda hate to rub it in. I’m kind of sitting out surrounded by the Georgia pines, nice breeze blowing, blue skies. It’s October and Georgia, it’s the best month of the year. So I hate to rub it in guys. Yeah, life’s pretty good. AC: (laughs) Well we feel sad. Although we live in San Diego, so we have nothing to complain about. FG: OK touché you got me there. I’ll give you that, San Diego is a beautiful town. You got to live in a beautiful part of the country. AC: We have this big blue thing called the ocean. It’s pretty cool. FG: Hey I’m a cold water swimmer too, so I would love to swim in the in the Pacific beaches off of San Diego. Yeah, that’s a personal interest of mine. I love to swim. JA: I got in this business in the late 1990s, and I think the mantra back then is that everyone wanted to retire at age 55, that was the goal, until 2000 and 2002 hit. And that hurt a lot of people. And then 2008, and now most people will be happy if they could retire at age 75. What is the secret? Tell our listeners. At age 55, that’s an aggressive age. And then I’m sure you heard of the FIRE movement with a lot of the millennials that are looking at saving 80% of their income. Let’s be reasonable. What what did you do? What were some of the steps that you took to be able to achieve financial independence at such a young age? FG: Yeah there’s a couple of topics there. Let’s talk about kind of the traditional path, and then let’s weave in the FIRE. I am kind of part of the FIRE community, I talk to a lot of those folks, I’m going to FinCon next week, so I’m pretty active with that whole group. And at first, from a “how did I get out of 55 standpoint” probably the most important is – and this is too late for a lot of your listeners – but it’s important to state. You’ve got to start early. And when you start a job at 22 out of college, man, plowing, at a minimum, get the 401(k) match, and start bumping it up. I’ve listened to Grant on your show recently, where he said he bumped it up 1% every month, that’s crazy. But if you can bump it up a couple of percent a year, maybe you get a 3% raise, you take 2% of it and you kick up your 401(k) contributions. You do that for a career, and try to average 15% to 20%. I probably started it maybe a little under 10%, and now I’m probably saving close to 30% plus, maybe 40%. If you can ramp that up and do it for a lot of years, and keep it invested in stocks, through the 20s 30s into your 40s, before you start getting into asset allocation for retirement, and let it grow and just leave it alone, dollar cost average, that’s the ticket. It’s save, spend less than you make, and do it for a long time. It’s not rocket science, but you’ve really got to be diligent at doing it for a long time, and doing it as aggressively as you can. And so bridge that over to the FIRE community, the difference with the FIRE community is they’re all trying to do it by the time they’re 40. So they’re saving 50, 60, 70%. You don’t have to be that extreme. But the principle is the same. You just spend less than you make and depending on how much less you spend, just kind of triggers how quick you can get out. So I think the other point that’s important for your listeners is, if you’re 45-50 and you haven’t really start saving for retirement yet, it’s not too late. You don’t have to freak out. You can kind of apply some of the same principles that the FI, Financial Independence Retire Early, the FIRE community, apply some of their principles. It’s never too late to start. And if you are starting late, just be more aggressive and you can still get out of and at a reasonable point in time. So there’s a lot of overlap between the two communities. JA: It’s hard, but you just kind of keep throwing money at it, you know? “Oh, what’s my asset allocation?” Yeah, that’s all very important, but if you don’t have any money, the allocation means nothing. So you’ve got to start with throwing some money at it, get committed to what your goals are, and save as much as you possibly can. And then from there, then you can start taking different layers. But I think people start, “Well, this mutual fund has a 1% fee versus 0.5% fee. I’m not even going to save into my plan because the fees are too high.” Well, what are you talking about? Save. And then figure it out later. You know what I’m saying? FG: Exactly. And I think the other big thing that people make the mistake of is they get caught up in the lifestyle inflation. If you’re doing good in your career, you get a nice promotion, it’s like, “Hey, I deserve that BMW” or whatever? Resist the temptation to have your spending go up as your income goes up, even if it’s kind of tough when you start out. It’s not as tough to avoid lifestyle inflation and just jack up your savings rate as your income goes up through your career. That’s a more manageable way to get into it. But yeah you’re right, for the first 10 or 15 years, don’t worry about it, just throw it all in mutual fund, global stock thing and let her rip, and start tracking your net worth, and wake up 10 years later and start caring about the details. But until then, until you get up to a couple hundred thousand, or let’s say $100,000 or above, just save. Don’t think about anything else. Just throw it in there and forget about it. It’s not that hard. AC: Yeah and I would say, just thinking about this, so I’m 60, and I’ll be retiring here at some point. But when I was, I don’t know, I’m thinking 40, 45 then the goal – all of my peers, the same thing – we’re going to retire at 50. And then it was 55, and then 60, and now we’re still working. But I want to ask you this because I think this whole FIRE group, of people wanting to retire younger, is great, but just simply having the money to retire, that’s kind of only half the story. FG: You’re spot on with that. And I’ve written a lot about that. I’ve been writing about two and a half years now, and I started out purely focusing on the financial side, and financial side, it’s not straightforward, but you can learn it. You can learn about pretax, after tax, Roth, make a backdoor rollover. You guys are experts at that and you’re very good at it. But to me, the part that probably deserves more attention and gets less, is what I call the softer side of retirement planning. What are you going to do post-retirement that that gives you that same purpose and fulfillment and joy of life? What a shame if you work 30 years or you’re super FI and you work 10 years? Doesn’t matter. What if you get out, and you worked all these years to save this money, and suddenly you’re depressed and unhappy? That happens to people. And it’s not really an area that people focus on as much as I think they should. And it’s an area, especially as I’m nine months away, eight months away from retirement myself, I’m spending a lot of time writing about it, thinking about it, reading about it. It’s a really important area that you need to put some real brain time into before you retire because it’s important. JA: We’ve been doing this show for a while now, and we’ve never really talked about the softer side of finance until Big Al started getting a little bit older. AC: (laughs) Until I get older. I brought up the gap year and Joe said, “What’s that?” I said it’s this article, but you take a gap year between your career and retirement and do all these crazy things. He didn’t seem to think that was an interesting idea, but I thought that was great. FG: I’ll tell you something kind of along those lines that you can do, that not quite as extreme as that, but something my wife and I are thinking about doing. We’re going to get a fifth wheel, we’re going to travel, we’ve got a cabin so we can kind of close the door and leave. A lot of weekend cabins up in this area so you can leave it for six months and we’re thinking, “Hey, let’s go out and work in Yellowstone for the summer.” Or, “Let’s go pack Amazon boxes for the Christmas rush.” It’s not something we’re going to have to do for the money, but it’s something that, for us, it’s kind of going to be interesting to just experience different things. You’ve got to find ways to explore, and keep things fresh, and develop that curiosity, and there’s a lot of different ways to do it. So yeah, it is building on the guy’s article you’re talking about there are ways that you can apply that in a less radical way. JA: We’re talking to Fritz Gilbert. Fritz, hold on a second. We got to take a short break. You got to check his blog out. It’s called the Retirement Manifesto. We’ll be back in just a second. The show’s called Your Money, Your Wealth. 21:18 – Fritz Gilbert: What Will You Do With Your Free Time? JA: Welcome back to the program, the show is called Your Money, Your Wealth. Joe Anderson here I’m a Certified Financial Planner with Big Al Clopine, he is a CPA. Appreciate you tuning in each and every week. We’re talking to Fritz Gilbert. He is The Retirement Manifesto, ranked one of the best blogs. He’s up for a Plutus Award finalist for the best retirement blog here in 2017. Fritz? AC: So you’re kind of facing this right now. And I think most people know they need to give this some thought. But how do they go about it? What are resources or how should they be thinking about it? FG: Yeah, and that’s the hard question. There’s no easy answer. I would argue the financial side of it is almost, in a way, easier than the soft side of it. And I would argue that, for most people that are really on a track to be retiring early, they’re probably more leaning towards the Type A personality anyway. I know I am. You’re always busy, you’re always active. There’s a reason you’re good in your job. You’re kind of driven, and that personality probably has a more difficult time making the adjustment than somebody who’s more laid back. So I can’t really speak to what the answer is. I can kind of speak to what we’re doing, but it’s really – I’ll give you an example. We’re up in the mountains now. My wife is in the cabin, and I’m still working for a little while. So she’s up here, and I have a little apartment, I come up here four nights a week in the cabin, and three nights down in the city, so she’s up here a little bit by herself with our dogs and whatnot. So we’re talking about this, “Hey, we’ve got to find a way to explore and try new stuff,” so she’s like, ” You know I always wanted to do pottery,” and I was like, “Take a pottery class.” So just like last week, she signed up, she took this pottery class, she loves it. Now she’s like on fire for pottery, and it’s great. I think you just have to be open to what intrigues you and show that same initiative that you had through your career, to reaching out and trying new things. I’m working on swimming, and I’m joining a group, I met a couple of guys who swim up here in the lake. I’m going to try and swim 10 months out of the year. I started the blog. I think it’s recognizing that you’ve got to find something to fill the void, and just experimenting. Be open to it. AC: Yeah, it’s funny. I think that throughout your professional career, you end up with these ideas, but you don’t have enough time. You’ve got a career, you’re raising a family, you’ve got responsibilities, and it’s like, well now it’s at a point where, all right, there are ideas that they’re always popping in your head, it’s maybe it’s just kind of go ahead and take action. FG: And something else that I’ve done, I’ve got a little Google sheet. I keep notes all over the place, and I’ve got this Google sheet, and I’m building up a bucket list, things that interest me, maybe I want to learn how to play guitar. Always wanted to learn to play guitar. Just random thoughts that you’re reading something, and “oh yeah that’s something that I’ve been interested in.” I just bought a drone. I did that because I want to develop aerial photography and making videos. I don’t know what I’m doing yet, but I’ll learn. And I think finding a way to capture those ideas when you come across them, and be able to pull them back out at the right time, yeah that that’s probably not a bad step. if you’re one to five years prior to retirement, start building that type of a thought process, and figure out a way to capture the thought. FG: Exactly. Yeah and I think, trying to be intentional, one of the things we did is that we moved to a retirement town, I mentioned that earlier, we live in the mountains now. We moved up here intentionally about a year and a half before we retired, and we did that on purpose so that we could start getting involved in the community and start developing relationships. We volunteer at a dog rescue thing every Saturday. I met these guys I’m going to be swimming with, we’re trying to find ways to get engrained in the community. And it’s obviously totally removed from work, it’s 100 miles away. So we’re trying to build those relationships now that will be there then when we retire, and it is a big part of it. The more you enjoy your job and the more you enjoy your co-workers, I think the more important it is to make sure you’re developing those things for the transition. FG: Exactly, I’ll tell you a story on that, it’s funny you brought that up. We had a weekend place up here for five years, we rented it, we made a nice income off of it, but it was always intended to be a retirement cabin, so sure enough, we move up here a year and a half ago. OK, Life is good. And when we started living full time in what had previously been a weekend cabin, we started noticing things about it that we’re like, “really, this isn’t exactly what we wanted for a permanent retirement place.” So we’re like, “well, we’re not married to this place. We’re flexible, we’re trying to figure this out as we go. Let’s kind of rethink what we want to do here,” and we kind of call it our good to great move. It was good. We really enjoyed it, it was good. But what can we do to make it great? And we started coming up with a list of criteria. What did we really want? AC: Yeah I couldn’t agree more. I was thinking about my dad, who had so many hobbies, and by the time he retired, he said he retired because he didn’t have time to work, and I think that’s a good attitude to have. FG: Yeah, and I tell you something else too, I don’t know how you guys feel about it, but I’ve been hearing more and more a lot of it guys – I’m one of the older guys now. A lot of people have retired ahead of me and I keep an eye on them, especially since I blog, I like to see how the transition is going for people, and I just find it very depressing, if somebody retires and two years later, they’re back in the industry working for somebody else, because they get calls from people. They say, “oh, your phone’s going to ring off the hook when you retire,” because I’m well-known in the industry, and it happens to everybody. And how sad is it that people can’t find something better to do than work. When you don’t have to work anymore for money. Shame on us if we can’t find something more fulfilling to do than work. To me, that’s just sad. JA: Thank you, Fritz. Appreciate that. AC: (laughs) Yeah Joe’s going to have to work on that. JA: (laughs) I’ve got to start on the softer side! AC: Hey I want to change gears just for a second, we got another minute and a half. So for our listeners that are maybe 2, 3, 4, 5 years away from retirement, what are maybe the top two or three things they should look at financially? FG: Yeah, that’s good. I wrote an article called “Five Things Somebody Should Do Five Years Before Retirement”. And I don’t have my computer in front of me, but basically, I think if you’re about five years out, the important thing is to really start paying attention to this stuff. Look at how much money you’ve got. One of the things we did about five years out, that was really helpful, is we track, and as painful as it is, we never did it once in our lives, but we did it for a year about five years ago. We tracked every dime we spent for a year, and we said, “OK, we’ve got to do this.” We made it 11 months. We didn’t make the full year, it was intolerable. But it’s really important. And then what we did is we took that itemized spending, and we said, “OK, what of these items going to drop off when we retire, and what items should we add in?” So “OK, I’m not going to need whatever for work, but we’re going to be paying for campgrounds.” So we made the adjustment, we came up with a realistic spending plan. I think that’s important because you’ve got to know what level of lifestyle do you need to fund before you can determine if you’ve got sufficient assets to be able to fund it. So start with the basics, how much money do you need to spend, and then you guys know the 4% rule. We’re going to be closer to 3% because I think the 4% probably inflated. We don’t have to get into that. But I think starting to then convert that spending requirement into what’s your portfolio needs to be, is probably the right next place to go and get a sense of how close are you to being on track. Those are the two biggest things to start setting yourself up to think about retirement. And then we talked about the softer side. As you do that, I think it’s also important to really start thinking about what do you want your post-retirement life to be. Where do you want to be? Are you going to downsize out of your house? All those softer sides, because you really need to do that to figure out your spending requirements anyway. You kinda want to know what type of lifestyle do you want to lead. So it kind of goes naturally with the process. Those three things, to me, are probably the most important things to do, in my humble opinion, when you’re five years out. JA: We’re talking to Fritz Gilbert, The Retirement Manifesto. So do you I’m one of those, or does your wife have one of those spinning wheels with pottery? FG: Not yet but I would be surprised if we buy one. JA: And then are you going to watch, like, the movie Ghost? JA: Get a little music in the background? JA: Patrick Swayze was the ghost. Come on Fritz! FG: I’m not good with movies. JA: So good. Well, I want to congratulate you on all of your success. Good luck. We got the Plutus Awards. Are you nominated? FG: The Plutus Awards, that’s a big deal, it’s like the Academy Awards for bloggers, voted on by your peers, so that meant a lot to me and I’m one of the top five- there are five finalists in the retirement blog category. So I was really honored and humbled to get that. And if you’re interested in retirement, get out there and start reading. You can read my stuff, but there’s other stuff too. Read it, start learning the stuff, and start developing your own plans, and life will be a lot better for it. JA: Thanks so much buddy. Hey, congratulations again and hopefully we can get you back on the show real soon. FG: I’d love to, we can do it after I retire next June. I really appreciate the honor of talking to you guys today. Thanks much. JA: That’s Fritz Gilbert. The Retirement Manifesto. We gotta take a break. The show’s called Your Money, Your Wealth. For even more useful information, visit YourMoneyYourWealth.com to access white papers, articles, webinars and over 400 video clips on tax planning, investing, retirement planning, Social Security, estate planning, small business strategies and tons more. It’s a veritable treasure-trove of information just waiting for you at YourMoneyYourWealth.com. If you need more help, you got a burning money question that just can’t wait, call us at 888-99-GOALS. That’s 888-994-6257. AC: This is from CNBC, and they kind of preface this with, “as Washington inches closer to the largest overhaul of the U.S. tax code in nearly 30 years, retirees with large sums saved and 401(k)s or IRAs may be feeling nervous about their money. Often they want a crystal ball to know what the tax rates will be in the future. Unfortunately, unless you’ve got a DeLorean time machine sitting in the garage, there’s no way to know when and if these changes will happen.” Which I agree with. JA: A DeLorean time machine. AC: Yeah, right? From Back to the Future. JA: You did watch that movie. AC: Yeah I’ve seen all three of them. Just the mainstream movies. AC: Yeah I did see that. I like that one. (laughs) Because I’m a positive, optimistic guy. So you wanna know what these three simple tricks are? AC: OK. Number one is saving money by helping others. And this is starting the year you turn 70 and a half. The IRS requires you to begin taking a minimum amount annually from your retirement accounts. This would include the IRA, the 401(k), could be a 403(b), or other types of retirement accounts. And it’s calculated by a formula, in case you didn’t know. When you’re 70 and a half you take your balance in your retirement account and divide it by 27. That’s the factor, which is also just about 4%, I think it’s about 3.7. But multiply your account by 4%, or divide it by 27. That’s kind of what you’re going to take out of those accounts. And some of you have done a great job saving, and maybe you’ve got pension plans, maybe you don’t even need your required minimum distribution, and if you’re charitable, you’re allowed to give it directly to charity, and that’s up to $100,000. You have to have a pretty big retirement account to have an RMD of $100,000, but they will allow you to give that much directly to charity. AC: Yeah. Or if your required distribution is 10 grand and you want to do five directly to a charity and keep five, then that’s fine too. So if you give it directly to charity, Joe, it does not show up on your tax return, and therefore you do not pay taxes on it. JA: Why would someone do that again? Because it all has to do with your income, your schedule A, and if you itemize, if you don’t itemize, because if you think about it, if I give to charity, then I can deduct it. AC: Yes. So for a lot of people that itemize their deductions, what’s the difference? The other words, they have a $10,000 required minimum distribution, that shows up as income on the front of their 1040. And then in their itemized deductions, it shows up if they want to give it to charity, they take it from the IRA, they pay tax on it, and then they give it to charity, shows up as a tax deduction, their taxable income will theoretically be the same. So why is there a benefit? And it turns out there’s a lot of reasons why you might want to do that. Probably the most obvious one is if you don’t itemize your deductions. Because right now the standard deduction. It’s a little over $6,500, or about $6,500 for an individual. It’s close to $13,000 for a married couple. And if your itemized deductions are lower than that, giving to charity isn’t really going to help you. because you get the standard amount no matter what. So that would be a way to save taxes. A lot of folks, they don’t necessarily need their required minimum distribution. And if they give it directly to charity, then they have less income on their 1040, so they pay less, plus their Social Security is taxable. JA: Right, Medicare or something. AC: Right. Maybe they get to deduct more losses from their real estate, if they’re over $100,000, that would be another one. Or if they have less income on the front of their 1040, maybe they have less of their itemized deductions phased out. Maybe they have less of that Medicare surtax because that comes up at different income levels. JA: You keep yourself in that 15% tax bracket, then you have no capital gains tax. If you sell the capital asset. AC: Yes. So it depends. I will say, for some people, it won’t really matter that much, because they have income and deduction, or they have neither and they’re in the same place. But I would honestly say, it’s probably the majority of folks that would get some kind of benefit if they are charitable anyway. If they want to give the required minimum distribution, or part of it, to charity, that they can do that and get a benefit. Number two, Joe, is: do a Roth IRA conversion as soon as you retire. Agree, disagree? JA: Yes, but you don’t want to wait until you retire, you might want to take a look at it today. AC: True. However, this article is three simple tax tricks just for retirees. JA: Oh, as soon as you retire. Yes, sure. AC: You’re right, you probably would have wanted to do them sooner, but we see this missed all the time. They retire, they’re 64 years old, they’re living off their savings, they’re keeping their IRA and 401(k) growing, they don’t have to pull money out until 70 and a half, they got almost no income on their form 1040. In fact with itemized deductions, maybe they have negative income. Shouldn’t you be doing Roth conversions in the years where you got negative income, and then fill up the 10% bracket, 15% bracket, maybe even in some cases fill up the 25% bracket? It all depends on what your income is going to be in retirement. But take advantage of the lower tax brackets while you can. JA: Absolutely, you have to take a look at it year by year. And there’s more than just that. You have to look at, what is your retirement income picture going to look like? What do you have is income? What’s your pension, if you have one? Do you have Social Security? What does that look like? Do you have real estate income? How much money have you accumulated in your overall retirement plan? What age do you want to retire? And what does your required distribution potentially look like? So there are a lot more calculations. There’s a lot of assumptions that you’ve got to make too. Because we have no idea what’s going to happen with tax rates. We have no idea what’s going to happen with the overall stock market. But you can make an educated guess, and I think that’s the best way to look at this, is to say, all right, well maybe I assume a certain rate of return of how my assets are going to grow inside my retirement account. I can then look at what I can assume that my fixed income sources will be, such as my pension, Social Security, what other income sources. And then you look at the RMD, and then I can tell you roughly, given what tax rates are today, what bracket you could be in. And then you look, am I going to be in a higher bracket, lower bracket? What does it all look like? And then you can start strategizing. But I’m here to tell ya, Al and I’ve been doing this a few days. And we have thousands of clients, and I would say the majority of our clients have monies in Roth IRAs. And a lot of our clients have hundreds of thousands of dollars in Roth IRAs, that they have converted over the last several years. I don’t think one time someone came to me and says, “Joe, I’m so upset that I have all this money in a Roth.” The taxes are paid, it’s forgotten about. And now they know that “Hey, I can pull all of these dollars out anytime I want, or never pull them out, and I’m not subject to a required distribution, it goes to the kids or heirs tax-free. There’s just more flexibility, I think when you take a look at that. Instead of saying, “oh, I don’t trust what’s going to happen with Congress, I don’t trust,” Well then live your life that way, I don’t. I want to make sure that I’m looking at everything and planning appropriately, to put myself in the absolute best position to have the most success possible. AC: Yeah, I think that’s what you have to do. You kind of have to go with the tax laws as they stand right now, although I will tell you this. Some folks are saying, “Well, maybe I’ll be in a lower tax bracket if this tax framework passes,” if tax reform passes. Well interestingly enough, you got to do your Roth conversion by December 31st. So if you want to do one for 2017, you have to do it by December 31st. But you have all the way until the extended due date of your tax return to undo all or part of it. So that means October 15th of 2018. So do you think maybe a year from now, we’ll have better clarity on what the tax reform, whether there was one or what it’s going to be? Do you Roth conversion now, particularly if you’re in a situation where you think it’s going to make sense for you, and I’m telling you, a lot of you folks, it’s going to make sense for you. Probably more than you think. Go ahead and do the conversion now, realizing you can re-characterize it. Now if you file your return in April, that’s fine. Just make that decision in April. But you have until October, and a lot of folks that normally file in April, they go ahead and extend their return until October, just so they have that more flexibility. Not a bad idea. Now realize, if you extend your return, you do have to pay the estimated tax with your extension in April. So you don’t get out of paying the tax. But then if you decide to keep it, you’ve already paid the tax. If you don’t keep it, well then you obviously get a refund or you apply that to next year. So a couple of different choices there. JA: Right. Or if you wait six months, what’s the penalty on that? AC: Yeah, like if you don’t pay the tax, then you pay it in October. Yes, so you get charged interest, which is 3%, a late payment, which is .5% a month, so it equates to about a 9% annual rate. So this will be half a year, it would be 4.5%. So it’s not inconsequential, but it’s not gigantic either. It’s not like it’s a 100% penalty or something like that. Joe, I will tell you the third one, which is separate your stock during your 401(k) rollover. That’s the net unrealized appreciation. But that’s when you have company stock, and in your 401(k), you might want to consider this strategy, where you actually pull your stock out of the 401(k) – that is after you retire – and you put it into your brokerage account, and you do pay taxes on your original cost basis, what you paid for that stock. But all of that unrealized gain, first of all, you don’t pay any tax on that until you sell the stock, and when you do sell the stock, it’s the capital gains tax. JA: That’s net unrealized appreciation. So if you do have company stock inside your 401(k) plan, before you roll that money out, make sure that you understand the law. If you have a burning money question, just call 888-994-6257 for your chance to talk to Joe and Big Al and have your question answered live during Your Money Your Wealth. That number again is 888-994-6257. 888-994-6257. Let’s take a call now. JA: I think we got Tom on the line. Tom welcome to the show. What can we help you with today? Tom: Thank you, Joe. I’d like to get some information, if I can, regarding donor-advised funds, and the benefit for myself, and the charity that the funds may go to, if that’s part of this, and how difficult is it to set up? JA: Yeah I’ll take it stab, and Al you can kind of clean this up. A donor-advised fund, first of all for our listeners, is almost like your own private foundation that you can basically establish for very low cost. All the major custodians put them together, Fidelity – we just had Fidelity Charitable on a couple of weeks ago, T.D. Ameritrade, Charles Schwab, you name it. And what you can do is front load any type of contributions, to get maybe a larger tax deduction in a given year. So maybe you’re giving $10,000 a year, but maybe you want to put $100,000 into a donor-advised fund. You would get a $100,000 tax deduction today. That money sits in this donor advised fund, you can invest it how you choose, and you can dole the money out as you choose. And so, when you look at that, it gives someone a lot more flexibility, potentially, from a tax perspective. But Tom, they’re very, very easy to set up, very inexpensive, for the most part. And I think, in most cases, you could give up to like $50 to $100 gifts. So it doesn’t have to be anything huge. But I think initially, you might need to put about $5,000 into them. AC: A couple other things Tom, is as Joe said, it’s a way to take future year contributions and deduct them in the current year. Maybe you have a big tax year, where you got a bonus, or you sold a property, or there’s some reason why you’re in a higher tax bracket. So it would be perfect to go ahead and get a little bit more tax deduction in the year where you have a high income. That’s a lot of times why people do it, and then you have this fund that you get to designate what charity it goes to, whenever you want to. But of course realize, you need to be charitable. (laughs) This is a one-way street. You put the money in, you can’t take it back. So that’s that’s one thing. The other thing about it to realize is, you can put your own cash in it, and that’s great. You put $50,000 cash in it, you get a $50,000 tax deduction. Better yet, if you’ve got stock, securities, mutual funds that have grown in value, appreciated stock, that’s outside of your retirement plan, you put that in, and then you get a tax deduction for what it’s worth the day you put it in, but you don’t have to pay the tax on the gain on sale. And so you’re getting basically a double benefit there – avoiding the tax on the gain on sale, and getting the full charitable deduction. Tom: What would happen if you wanted to donate stock that you believe will be appreciating in the near future and it’s not publicly traded at this point? JA: You want to wait. AC: Yeah I don’t think a lot of the donor-advised funds would even accept a private company stock. JA: Yeah, because once it goes in – let’s say it’s worth $2 a share. You put it in the donor-advised fund today. You’re going to get the tax deduction for $2 a share, even if they held it. The donor-advised fund is not going to pay tax on any of the gains, so that would help, but I’m not sure if they would allow you to do a private. So I would hold it outside, continue to wait to see what happens, and then on that $2 a share is now worth $2,000 a share, then you could put whatever dollar figure into the donor-advised fund, you get a tax deduction, and then I would sell the other shares outside, because that tax deduction could offset any of the capital gains that you would receive when you do sell the those other shares. JA: Does that make sense? Tome: Yes it does. Thank you. AC: Something else to realize is when you put cash into a donor-advised fund you can deduct up to 50% of your adjusted gross income. When you put appreciated stock in, you’re limited to 30% of your adjusted gross income. So you can’t completely zero out your income, but you can reduce it substantially. If you put more in the donor-advised fund than you can actually deduct in any given year, then you can carry it forward for another five years, and you go through that same test again in the following five years. Tom: In this first year, can you supplement the stock with cash to get up to 50%? AC: You could do a combination, yes. And so what would happen there is, some of that contribution would be at the 50% amount, and some at 30%, and I think the way that the tax software does it is it starts with a 30% on the stock and then limits it. And then if there’s some cash part, then it would take it up to the 50%. So the answer is yes. JA: I got another question for you. What’s the ultimate goal? It sounds like we have this company that you have ownership in, that it potentially is going to give you some significant gains. Do you want all of that to go to charity, or do you need to spend some of it? Because there could be other charitable plays that you could do, that would potentially avoid the capital gains tax, as well give to charity. But you could also benefit from some cash flow as well. Tom: Well, I was looking primarily in this particular year because of a large long-term capital gain, to be able to offset some of the tax that I would have on that. And I have the potential to use some of this appreciating, what I believe will be, appreciating stock today to offset some of that gain. JA: Okay. So you already sold another security or another asset that you already have a large capital gain, and so you’re looking at before the end of the year, what type the planning that you could do to mitigate this. You also have another security that’s privately held, that is also potentially going to give you another gain, then you were thinking of using some of that to help offset the gain of the sale of the asset that already occurred this year? JA: Sounds like Tom, we gotta be talking to you for financial advice! (laughs) What’s this guy into?! AC: Let me let me follow up, Tom. Do you normally have a lot of ordinary income as well, or is most of your income capital gain? Tom: My income is not typically very large. I had invested in a company maybe 6, 7 years ago and it was sold at a profit. A significant profit. The very first distribution of that, I really had not prepared at all. Now I’m getting another large amount, and I’m trying to mitigate the tax ramifications if possible. AC: And as you said the amount you’re getting is capital gain. And the reason why I ask that is, if you typically have higher ordinary income as well, sometimes a donor-advised fund is not the best solution because you’re taking an ordinary deduction and netting it against a capital gain at a low tax rate, and not getting as much benefit as you might think. But that’s where you’d have to run tax projections. But that doesn’t sound like your case. JA: Hey Tom are you married or single? JA: Married. And do you know what tax bracket that you’re in, without the capital gain? With your just standard income that you receive right now? Tom: It’s either the 25 or 30. JA: OK. Well, how much income total do you have besides a capital gain? JA: And so yeah, you’re in the 25% tax bracket. Got it. How much is the gain? Because you might be subject to the Affordable Care Act. You might jump yourself into a higher capital gain as well. Do you know how much, roughly, the gain’s going to be? JA: Yeah, that’s going to blow you up. That first distribution hurt a little bit. (laughs) So yeah. Now you’ve got to worry about that $750,000, Al, is going to put him at 20% capital gains rate, plus 3.8% Affordable Care Act, or the net investment income tax, and then whatever state tax that you’re paying. JA: You’re in California as well? OK, so that’s 35% that you’re potentially going to lose right there off that $750,000. So yeah, I think that donor-advised fund, if you didn’t sell… But you already bought that asset. Because there could be a charitable remainder trust that you could put some of those assets in and sell it, the trust sells those shares. They don’t pay any tax, you get a tax deduction for that, you can invest those assets how you please. And then you could potentially get an income stream from that as well. So there could be a couple of jockeying moves. But yeah, the donor-advised fund is a cheap way to do it. You can set it up yourself. You don’t have to get attorneys and huge legal fees there. So hopefully that helps. Tom: But typically the financial institution that sets it up would sell that asset that I gave them. JA: Yes and no. It depends on what financial institution that you go. There could be like a third party fiduciary, that basically will do the oversight to make sure that whatever charity that you choose is actually a 501(c)3, that’s legitimate. But you could give your money – it’s your money, you could give it to whoever you want. AC: But as far as the asset going in, you can sell it, or you can keep it there. You actually designate how you want it to be invested. JA: Yeah, they’re not going to invest that money for you. You’re not putting it like that. So you would still be the trustee of it, where you could pick and choose your investment. Tom: OK. Because I have tried to talk to Schwab or other financial groups, and the first thing they want to do is sell the asset I give them. JA: Well yeah. Because they probably want to manage the money. AC: They want to manage it and charge you. But not all of them do that. Tom: OK. I’ll keep looking. JA: OK Tom, thanks a lot for the phone call. Have a great weekend. Tom: Thank you very much for your guidance. JA: All right congratulations on everything. 54:20 – Can I Day Trade My Roth IRA Account? AC: We got one from Mike in San Marcos. He asks a straightforward question: “Can I day trade my Roth IRA account?” I’ll let you answer that one. JA: Mike, what are you doing? Why would you want to day trade your Roth IRA? AC: Well, what if you make lots of money and that’s all tax-free? JA: But what’s the probability. AC: (laughs) Well, the probability is not great. But what if he was the one that’s really at it? JA: No. Don’t day trade. Can you day trade in a Roth? Well, it depends on the custodian. AC: Well, I guess the answer is generally yes, you can trade as often as you want in a Roth IRA. It’s not an account where you can only make investment allocations once a year. JA: Well, it depends on the investments you select, it depends on your custodian, it depends on a lot of different things. AC: But what’s wrong with day trading? JA: There’s a high probability you’re going to lose everything. So what is day trading, if you’re training hundreds of thousands of securities, or trades, on a day by day basis. In other words, you’re getting in and out in a micro-minute. JA: Or even let’s say you want to buy Apple stock. And hold onto it. AC: Yeah, that’s another way to go. Day trading is frequent trading. I guess it doesn’t have to be each day, but it’s generally quite frequent. AC: Right, it would be nice if it was reliable and dependable. JA: But the answer Mike is absolutely. But be careful, because it is challenging, difficult to get money. And I get why he wants to do it in a Roth because there are no taxes. So if he’s day trading in his taxable account, and if he’s good at it, then you’re going to get a lot of short-term capital gains. Short-term capital gains are taxed at ordinary income. So all of the gains that you’re getting is getting wiped out with the ordinary income tax, depending on what tax bracket he’s in. JA: Next question. I’m not going to encourage day trading. AC: (laughs) I am not either. And the reason that we don’t encourage it, is because day trading presumes that there are clear crystal balls on what’s going on in this case, sometimes minute by minute. JA: They’re looking at the charts, it’s not fundamentals. Well maybe Mike does, but he’s not digging into their financials. JA: Yeah, what about Joe? Juan! Killing me! Seriously! It never fails! Never fails! But one thing we did experience this week, there’s a gentleman that is a big fan of the podcast. And so he was in our office, meeting with one of our advisors, so we popped in and said hello. And I guess our advisor, Allison, said, “hey, have you done anything interesting at all?” “No. But hey, can I meet Joe and Big Al?” He was like hanging out with Trump in the Oval Office. But meeting Big Al was better. And Joel. AC: And he knew your name. He said, “I don’t know why people call you Joel, you’re Joe.” But that has been 50/50, right? JA: Yes. At best. (laughs) Thank you, Casey. We appreciate your listenership. AC: Juan, yes, he did say Hi Al. JA: Yes, so Juan. This is not tax chat with Big Al. This is called Your Money, Your Wealth. And if you realize who does all the intros in the outros? It’s me. It’s not Big Al. JA: Yeah, Exactly. (laughs) How about that one client? He goes, “You could get that marketing guy out, he doesn’t need to be in the meetings.” Marketing guy?! What the hell are you talking about?! AC: You’re the marketing guy. You’re the pitchman. Ins and outs. AC: (laughs) Right. Well anyway, here’s his question. “Hi Al, I got $150,000 in a 401(k) with Vanguard. It’s money I do not need for the next 10 years. I’m retiring in six months. Should I stay with Vanguard or Spiders IRA No Return?” I don’t know what that means. “Spiders, IRA’s, no return, and charge a lot. What should I do? Not worried about high returns. Thanks for your advice.” I am missing the meaning of that. “Should I stay with Vanguard or Spiders.” Maybe that should be a period. IRAs no return and charge a lot. Oh I guess he’s saying his IRA gets no return and they charge a lot, what should I do. Okay. JA: If his money’s at Vanguard, they don’t really charge all that much. JA: Alright Juan, here you go. Because you didn’t ask me. I’m going to give you the answer anyway. You’ve got 10 years. JA: Right? Yeah exactly. Don’t take my word for it. What’s that? Anyway, I digress. You got $150,000, you going to retire in 10 years. First of all, how much money do you need? What does your other income sources going to be? How much money are you spending today? How much do you plan on spending in the future? Do you have any other fixed income sources? Is it an IRA? Roth IRA? You’ve got to start looking at so many other things besides spiders and creepy crawlers and Vanguard, no. Start with the plan, then how to allocate your overall asset allocation. How much money should you have at risk? So you’re saying, “Hey I don’t want to take on a lot of risk.” Well, how do you know? I had a discussion with someone, it’s like “well what about risk tolerance?” I don’t care about risk tolerance. Its risk capacity is a better understanding. I know that might sound the same for a lot of you. Risk tolerance means if the market goes down I’m going to freak out, and I’m going to pull out. But you still need to target a rate of return. Juan, you’ve got $150,000. $150,000 is a lot of money, but it’s not going to produce a lot of income. So you got 10 years. So if you have a globally diversified portfolio, let’s say that grows at 6%. Well, now you have $300,000. How much money are you saving? How much money does that need to build up? You have time to take on a little bit of risk. So it’s not necessarily what your risk tolerance is, I don’t want to take a lot of risk because I’m afraid of the markets. You have to figure out what target rate of return that you need to generate the income that you need to accomplish your goals, and then build the portfolio that way. AC: Yeah that’s a good answer. That’s a correct answer. In other words, it’s hard to give investment advice without knowing a whole bunch of other things. I will add a couple of general things, though, and that is if you have 10 years before you need the money, that’s a fairly long period of time. You think of the Great Recession. The market went down for what, Joe, 18 months? 20 months, something like that? This was the worst economy we’ve had since the Great Depression. So in other words, usually these recessions are not over for years and years and years. They happen. It’s tough, yes, but they do recover. If you’ve got 10 years, you got time to weather the storm. So I would encourage you to take some risk, but I wouldn’t begin to know how much, without doing planning to figure out what assets you have. And then it’s like, well if you have Roth IRAs too, it’s like OK, so you want to take some risk, maybe you put the riskier assets in the Roth because those grow tax-free, and then you’ll end up with more in your pocket. So there’s a little bit more to this. It does sound like you’re using low-cost funds, which Vanguard and others are known for low cost, so I think that’s a good thing. JA: But he thinks they’re expensive. I think he’s focusing on the wrong things. Juan. Save some money. Figure out what the allocation should be. Start looking at what the overall plan is. All right. See, Juan, put my name in the e-mail next time, I’ll be a little nicer. (laughs) That’s it for us today. Hopefully, enjoy the show. For Big Al Clopine, I’m Joe Anderson. Show’s called Your Money, Your Wealth. We’ll see you next weekend. Actually, on the podcast, I’m the one that does the intros and outros, so I guess I’m the Sham-Wow pitchwoman. “You’ll say wow every time with Your Money, Your Wealth!” Anyway, recapping today’s show with Joel – I mean Joe – and Big Al: Will the Trump Administration be able to develop an actual tax plan? We’ll have to wait and see. Retirees may want to take advantage of tax tricks like giving RMDs to charity, NUA and Roth conversions – and those last two aren’t just for retirees. And donor-advised funds may not be the best choice for you, but as always, it depends on your circumstances. Call 888-994-6257 to start on a financial strategy that’s tailor-made for you. Special thanks to our guest, Fritz Gilbert. Visit TheRetirementManifesto.com to learn more.